The condo above ours is a vacation rental as well. No one is there full time! Our property has 24 hour surveillance. OUTSIDE Only. The camera monitors the front door/parking area for the security of our property and our guest. Nestled on the banks of the Cumberland River, just walking distance to the Nashville strip, ‘Southern Sweet’ offers a little down home Southern charm. This ground floor unit offers easy access, with parking near the front door, a swimming pool, fitness room, and laundry facility on premises. Want to get away? This property is perfect for the business traveler who needs a little home comfort, or a couple that wants to enjoy the Music City night life. This condo is not offered for rent on Craigslist. If you are seeing this on there it is a scam. Quiet Location! Walk to Everything! Lounge by the pool and watch the boats go down the river. No extra charges for extra guests and parking for to cars is free. WE ONLY ACCEPT ONLINE PAYMENTS THROUGH THIS WEBSITE. NO CASH, CHECK OR PAYPAL. This condo is NOT listed for rent on Craigslist. If you are seeing it on that website it is a scam. We only rent through HomeAway/VRBO Family of websites. Chris and Shawn (Missy) live on a horse farm in Middle Tennessee, and love to travel. They grew up in Chattanooga, TN, and later moved to the Nashville area. They love Music City, and all the unique little towns in the surrounding area. We loved the location of this property. It's quiet, yet so close to all the attractions in downtown Nashville. Being on the river, with a pool, was an added plus. The complex has a wonderful mix of locals and vacationers. The residents are welcoming and friendly and there is just a good vibe here. This charming condo has designated parking just steps from the front door on the ground level. There is also a second parking spot to the side of the building. The pool is just a few steps from the unit but separated by the parking lot. Which means you don't hear the noise of the swimmers. Pool open from Late April until Late October, weather permitting. The location is wonderful. Walking distance to everything downtown without all the loud noise of the strip. Our unit offers everything to make your trip enjoyable. New Refrigerator w/o ice maker We provide an Ice tub which will be filled and ready for use upon arrival. We have ice trays filled and ready. Plenty of dishes and utensils for your whole family. Pots & pans to cook full meals Coffee Cups Wine Glasses Margarita Glasses Acrylic Tumblers Children's cups Also paper plates for your use. Stereo with Bluetooth located in unit. A few books in drawers under TV in living room. Riverside patio with grill and fire pit available for use near laundry and fitness rooms. Although this unit is located on the ground floor furnishings make it inaccessible to wheelchairs. The bathroom is not handicap accessible either. The condo above ours is a vacation rental as well. No one lives there full time! Wonderful complex with a mix of owners and vacationers alike. Close to everything yet quiet and out of the way. Check out time is 11:00 AM Central Time. Check in time is 4:00 PM Central Time. NO EARLY CHECK IN Unless owner approved. We try to accommodate early check in or luggage drop off. But you must inquire first. While we allow up to five (5) guest to stay in our condo. If you have five adults and are looking to stay in this one bedroom, understand that it will be crowded. We try to provide everything you need to make your stay at Southern Sweet condo enjoyable. Our stay was terrific....clean, close to broadway....nice furniture.......fantastic! Spent three nights here with my family of four over spring break. The location was really nice--a short 15 minute walk to Broadway and all the Downtown Nashville sites (Country Music Hall of Fame, Ryman, etc. ), though we did feel better about taking an Uber back at night. Centrally located so that you can easily access other areas such as East Nashville, Gulch and 12 South within a 15 minute drive. This is a ground-floor unit right next to your parking spot, so loading/unloading is easy. Nearly every amenity you could need is provided--only miss was soap or shower gel for the shower. Even had some extra power strips and USB cords for charging all your devices. All amenities listed were as advertised and in good shape--the coffee maker had an option for a full pot or just a single cup, and there was an additional K-cup brewer in case you need two cups ASAP. The master bed was extremely comfortable--soft linens and plenty of quality pillows. The sleeper sofa bed and the roll-away weren't uncomfortable, but weren't necessarily "luxurious" either--they're what you'd expect. My son actually slept on the recliner and was very comfortable. Towels were plentiful and soft. Bathroom was a bit tight, but it wasn't problematic. The pool was not yet open during our visit, but it looked nice. Laundry facilities were clean and well lit, though a bit of a walk (3-4 minutes?). The only real criticism we had wasn't with this property, but with the upstairs neighbors. They were intolerable. Loud voices and heavy footsteps throughout the day and night are easily heard. One night, we were kept awake for nearly two hours after midnight by what sounded like a pro wrestling match--complete with screaming (not exaggerating) and numerous loud thuds on the floor (our bedroom ceiling). Another night we were awoken at 3am by someone pounding on OUR door who was looking for the upstairs neighbors. We had to yell through the door that they had the wrong address, and they eventually found their way upstairs. It was unsettling and it took us a bit of time to get back to sleep. The owner is aware of them and reached out to us personally to apologize. So if you stay here, know that this is a possibility and reach out to Missy if any problems arise. So overall, I would recommend this property based on location, amenities and price. But if you are not prepared for the possibility of the upstairs neighbors causing issues late at night, this might not be the best place for you. We enjoyed our stay very much. This condo is in great shape and has everything you need. The riverfront location is great.....near the heart of Nashville. We did have issues with the keypad not working. Thank you for staying with us. We are taking your recommendation under advisement. The keypad issue has been taken care of. We also have a backup lock box with extra keys. Guests are never in danger of being locked out. We enjoyed our visit to Nashville even though it rained almost every day. My husband and I were here for Quiltcon 2019 mainly but came for the whole week to explore Nashville. We attended the symphony, Ryman Auditorium, Tennessee State Museum, Parthenon, Frist Art Museum, The Hatch, Farmers Market, and so much more. Looking forward to returning in the future. Our condo was very comfortable, it had everything we needed. We used free public transportation to get downtown. Shawn responded promptly to all my texts. Thank you for staying with us. We are here 24/7 for our guest. You can text us at any time of day or night. We came to Nashville to run the Hot Chocolate, and this condo was a perfect location. There is a nice running/walking trail practically outside the door, and getting to the Centennial Park and Farmers Market was a snap. We walk alot when in a new city, and walking to downtown was an easy and not too lengthy journey. The condo has all that you need. Comfy bed, lots of hangers in the closet, lots of brochures for various attractions in town. Rarely heard noise at night, except from the tenants upstairs, but even that wasn't bad. The white noise machine was great to have! Thank you for staying with us. We would love to host you again next year! 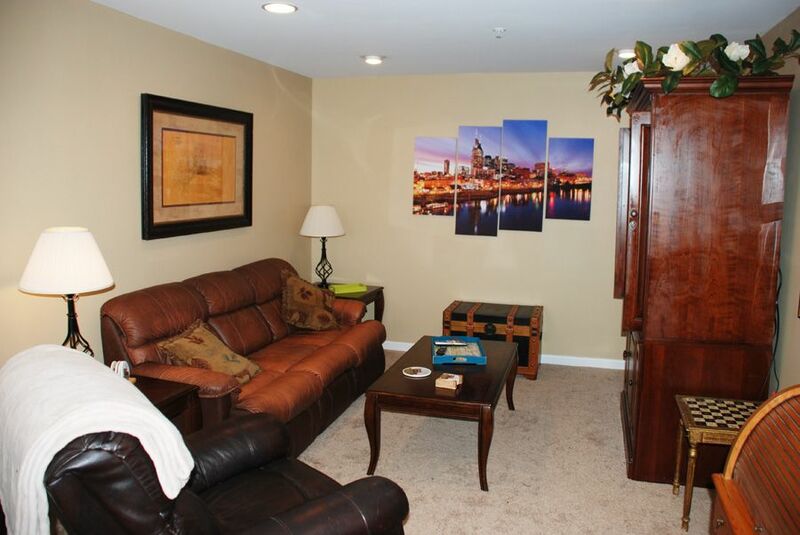 Easy Interstate access, no need to drive through the downtown area to get to and from condo. Only two (2) blocks from First Tennessee Field for the Nashville Sounds Baseball team. The Tennessee Titans' LP Field is visible across the river. Bridgestone Arena, home for the Nashville Predators, is located 1.4 miles away. CMA Music Festival is held every year downtown. The Ryman Auditorium, original home of the Grand Ole Opry, is located only a few blocks away.